Difference between revisions of "Doorduino1"
Old, metal keys have certain disadvantages, one being that they are not easy to revoke when compromised (unless you invest in really expensive lock systems). Several ideas have been passed around on IRC: SMS-based challenge/response, wifi with ssh logon to unlock the door, something USB based (yubikey's) and finally iButton one-wire devices. After a short trial with the yubikeys we settled on one-wire devices. The resulting system is also mentioned on hackcess.org. iButton's are small metal can's (about the size of a 10 ct coin, 5mm deep) that house a small chip inside. The chip has a unique identifier and optionally some memory, sensors and processing capability. The chip communicates using 1 signal and 1 ground wire, connected to the top and sides of the can. By pressing the can onto a reader/holder it can communicate to other devices on the one-wire bus. There are many ways to interface with a one-wire bus, using either serial, usb, i2c, parallel or custom interfaces. 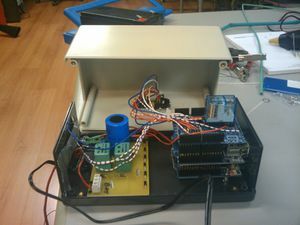 Our initial tests were done using some id-only iButtons and a iButton socket connected to an arduino. This worked quite well, and we managed to get the basics working in a matter of minutes (wonderful since we had neither experience with one-wire devices or with programming the arduino). For a more permanent solution we wanted to interface directly to a pc's serial port. We settled on a one-wire to serial interface chip, the DS2480B+ (http://www.maxim-ic.com/quick_view2.cfm/qv_pk/2923). 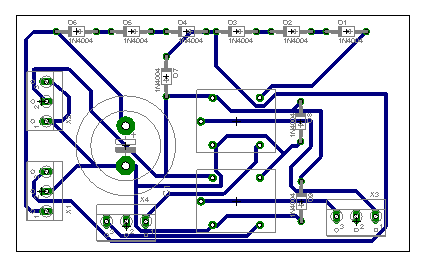 However, the solution with the serial port and pc appeared finicky, partly because we did not create an SMD board but soldered wires to the tiny chips. Also, the pc solution is somewhat more involved to set up in such a way that the electronic lock still works when the power is down. Therefore, we went back to arduino, and implemented the whole thing as an autonomous system based on an arduino, some code and a handful of hardware. Update: pin A4 is connected to a relay on the legacy remote door opening system, and is pulled to ground to trigger opening of the door. Pin D8 is connected to the reset pin of the ethernet shield. I had to bend the reset pin of the ethernet shield so that it does not connect to the arduino itself. 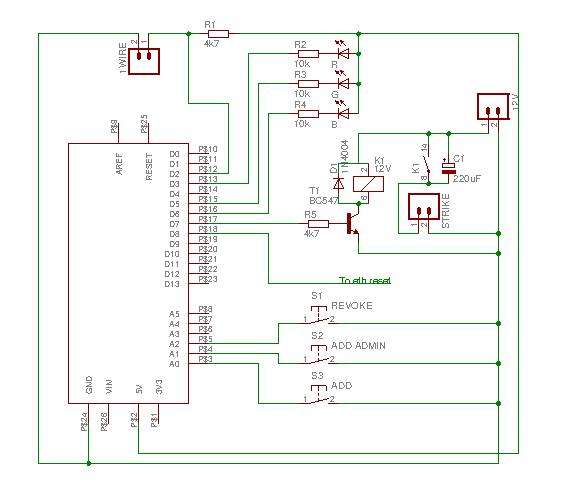 This is necessary for the old-design ethernet shield, which does not have a reset circuit on-board and will not initialize properly on power-up. 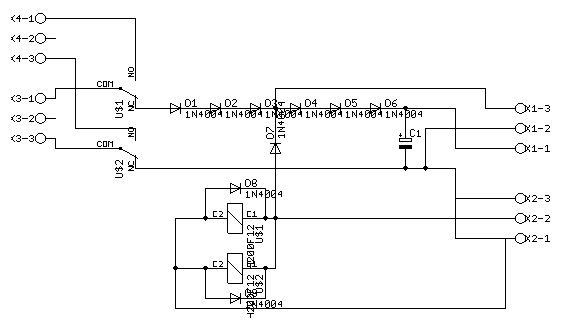 There is code in the arduino sketch to manually reset the ethernet shield from within the program. What this is still missing is a zener to protect against power surges on the one-wire bus, and perhaps some protection against 12v going back into the arduino if T1 shorts. Of course, you could use a CC instead of a CA RGB led. We're using a 12V 7.2Ah lead-battery, with intelligent charger to keep the battery charged without overcharging. This code on github implements the above more-or-less. The server keeps a shadow db of the programmed keys. This will probably be in the LDAP database, and the revocation list is sent to the arduino when the arduino asks for this, one key at a time. The server can keep additional information about the key, eg it's owner. When access is granted, the sha256 hash of the key's address is sent to the server over http. When a key is to be revoked, the server responds with a sha256 hash of secret1 (an arbitrary string, shared between server and arduino) and the key address. Before deleting the key from the EEPROM, the arduino will send a sha256 hash of secret2 and the key address to the server to confirm it has received the revocation request. The system has an RGB led for visual feedback, this table will allow you to understand what different color/state combinations mean and what it is doing.